The June 2009 issue of Esquire (which hit the stands on May 10) features another round of the annual Best Bars in America list. The list is part of a nifty ten page section titled “The Esquire Bible of Drinking,” or “The Collected Wisdom of Esquire as it Relates to Drinking.” (The issue also features a super hot cover and portfolio of Megan Fox, but I digress.) As always the list is eclectic, almost to a fault. New this year are craft cocktail bars like The Varnish in LA and SF’s Alembic, but also new is The Buffet in Tuscon, a “classic Arizona dive.” With such a broad range, it’s hard to pinpoint the criteria for how a bar gets listed. Esquire will only say that these bars are “harmonious and radiant places where the bartenders are generous, the taps are clean, and the conversation is at least mildly amusing.” Doesn’t exactly narrow it down, does it? At least Esquire is more specific about why a bar is bumped off: the Chateau Marmont was deleted “for cause,” and an unjustified “sense of self-importance.” At any rate, it’s the kind of list that starts conversations (or arguments) and gets the imagination going. So how did the locals do? 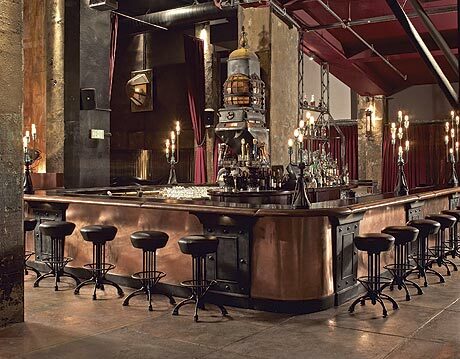 The Edison is currently in the Top 5 with a 77% rating, jockeying with SF’s Bourbon & Branch for the 4th and 5th spots. I say “currently” because the online polling is always open, and depending on when you check the list, The Edison is either number 4 or 5 in the country. As expected, 213 is well represented with Broadway Bar (69%), Golden Gopher (77%), and the Varnish (N/A). And Musso & Frank (76%) and The Polo Lounge (71%) are among several LA landmarks on the list. You can search and view the entire database here.